Wallace House Presents a Special Event with NPR's "1A"
February 15, 2018 | 6 to 7:30 p.m.
Join Wallace House and Michigan Radio for a special event with NPR’s daily talk show, “1A.” Joshua Johnson and his panel of guests will examine the First Amendment, free speech and what it means in a divided America. The discussion is of particular urgency and value, as the debate over allowing white supremacist Richard Spencer to speak at universities, including our own, rages across college campuses. Come and participate in the national conversation, meet the production team and experience the show. “1A” is an NPR daily radio program. Host, Joshua Johnson, convenes a national conversation about the most important issues of our time. The show takes a deep and unflinching look at America, bringing context and insight to stories unfolding across the country and the world. 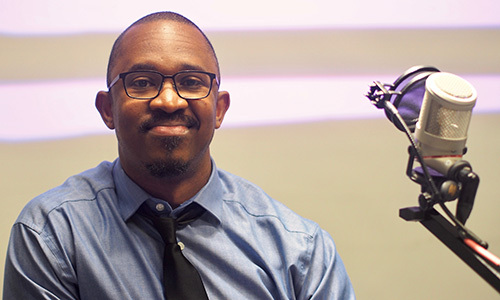 The program, production of WAMU in Washington, D.C., airs on more than 200 NPR stations and can be heard on Michigan Radio every Monday through Friday from 10 a.m. to noon. Joshua Johnson is host of “1A,” one of the most important daily conversations in America. Before joining “1A” at WAMU, he co-created and hosted the provocative nationwide public radio series, “Truth Be Told,” which explored race in America. Johnson also taught podcasting at the UC Berkeley Graduate School of Journalism. He is an active member of the National Association of Black Journalists. Johnson began his public radio career helping launch a unique regional news partnership between Miami’s NPR station, WLRN, and The Miami Herald. Then he served for over five years as morning news host for KQED in San Francisco. The series invites students, faculty and staff to openly discuss, listen and engage with differing views on free speech and to advocate for voices that have historically been silenced – important issues that continue to challenge both our campus and the nation. Sponsored by several U-M units and part of overall Diversity, Equity & Inclusion efforts on campus, this series of events explores how views about speech and inclusion play out in politics, culture, higher education, sports and journalism, and how to engage in productive conversation that can promote a positive campus environment and help the community more deeply understand these complicated issues. Michigan Radio is a co-sponsor.